Two dogs working together at the head of a dog team. The dogs are connected by a neckline (approximately 10 inches in length) attached to each collar. A method of harnessing dogs where each dog is connected to the sled by its own gangline. It is used for teams working on pack ice, so that one or two dogs falling into a crevasse or open water won't drag the rest of the team in with them. The line connecting the dogs to the sled or cart. In a conventional hitch, the dogs are connected either individually or in pairs to the gangline. The command used to direct the lead dog(s) to go to the right. The command used to direct the lead dog(s) to go to the left. A short leash, approximately 10 inches in length, with snaps on both ends. It is attached to the collars of two dogs working in double lead to keep them together. The command used to direct the lead dog(s) to continue "on by" a distraction of one sort or another on the trail. A single dog working at the head of a dog team. A large hook which the musher can stamp into the snow to create an anchor to prevent the sled from moving. 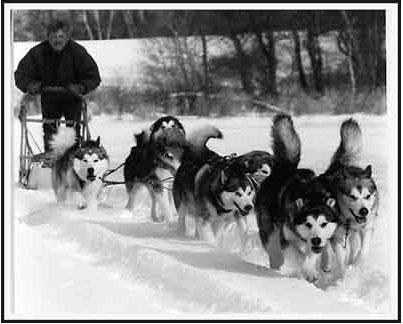 Dogs working behind the leader(s) of a team but not at the closest position to the sled or cart. Swing dogs are also called point dogs. Dogs working closest to the sled or cart. The face markings found on some Malamutes, particularly black and white ones. The bar is a stripe of dark color running from the forehead down to the nose. The goggles form a "mask" of dark color extending to the cap. The combination of bar, goggles and cap form what is known as a full mask. The size and density of the skeletal frame of the dog. The Malamute must be a heavy-boned dog. The usual colors range from light gray through intermediate shading to black, sable and shading of sable to red. A black and white Malamute has black guard hair and black or dark gray undercoat. A gray and white Malamute has gray guard hairs with light gray, cream, or white undercoat. A seal and white has black or black-tipped guard hairs with a white or cream undercoat. From a distance this dog will appear to be black and white. A sable and white is a dog with black or gray guard hairs and a reddish undercoat and red trimmings. A very light colored gray coat is referred to as a silver and white. Less common is a red and white coat. This coat contains no black coloring. All of these coat colors are accompanied by white furnishings, meaning the legs, chest, belly, underside of the tail, and the "derriere" are white. The only solid color that is acceptable is white. The type of coat found on northern breeds, where the coat is composed of two types of hair: a longer, coarse guard hair which is very weather resistant, and a soft, dense undercoat which acts as insulation. Dark color under the eyes which is less intense in appearance than the goggles. Eye shadows do not extend out to the cap. Facial markings where the face itself is all white with a widow's peak or "cap" of dark color. The color of the lip line and eyes. Dark pigmentation is preferred. A lightening of the center portion of the nose from black to a pale liver color. It occurs during the winter months and is common among northern breeds. During summer months the nose regains its normal black color. Abbreviated CD. A title awarded by the American Kennel Club in recognition of a dog successfully completing competition in the Novice class at three obedience trials. It is placed after a dog's registered name. Example: Fire 'N Ice Once Upon A Time, CD. Abbreviated CDX. A title awarded by the American Kennel Club in recognition of successful competition in the Open class at three obedience trials. It is placed after a dog's registered name. Abbreviated WLD. A title awarded by the Alaskan Malamute Club of America in recognition of dog's ability to work as a single lead dog on a team. It is placed after a dog's registered name. Advanced working ability is recognized by excellent titles. For example WLDX. Abbreviated WPD. A title awarded by the Alaskan Malamute Club of America in recognition of a dog's ability to work as a pack dog. It is placed after a dog's registered name. Advanced working ability is recognized by excellent titles. For example WPDX. Abbreviated WTD. A title awarded by the Alaskan Malamute Club of America in recognition of a dog's ability to work on a dog team. It is placed after a dog's registered name. Advanced working ability is recognized by excellent titles. For example WTDX. Abbreviated WWPD. A title awarded by the Alaskan Malamute Club of America in recognition of a dog's ability to successfully compete in weight pull competitions. It is placed after a dog's registered name. Advanced working ability is recognized by excellent titles. For example WWPDX. Banner: "Stella." Owned by the O'Brien Tyer Family.